We’ve waxed poetic about the benefits of energy efficient light bulbs and their advantages are many. But the backlash from designers and consumers is coming to a head and although most people want to save energy and lower their utility bills, they also want their living space to be cast in the warm glow that fluorescent lighting just can’t reproduce. 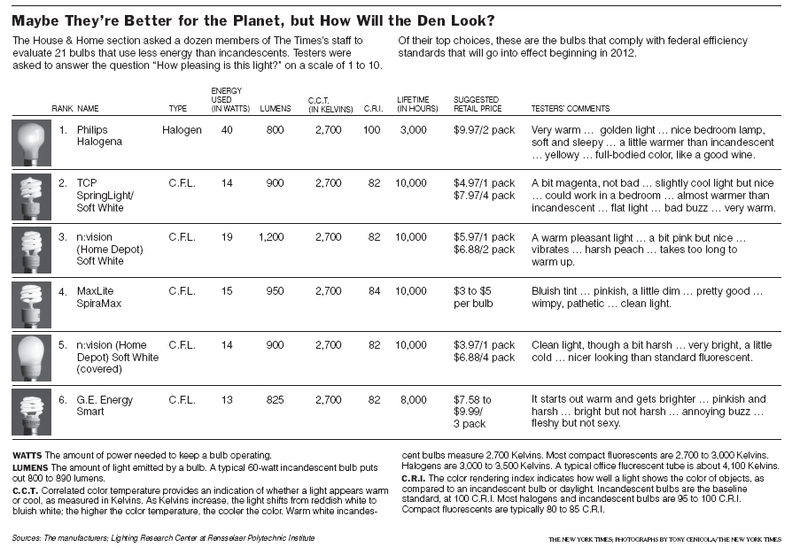 The New York Times House and Home section did an informal survey on “how pleasing the light is” from these energy saving bulbs and the results were not positive. Although the light from these bulbs is getting “warmer” there is still quite a gap from the incandescent bulbs. The halogen and LED’s should also be considered as they tested a bit better than the fluorescents. What’s the Difference Between a Range, Stove and Cooktop?